We are currently interested to hear from highly qualified candidates for graduate student, research intern/associate, or postdoctoral positions with an interest in the neural basis of learning, memory and memory-based decision making at the single-neuron level in humans. We are also open to candidates interested in computational/theoretical work in this area. For grad students and postdoc, ongoing or completed PhD in neuroscience or closely related field is required. For all positions, strong quantitative and programming skills are essential. Interested applicants should contact Ueli Rutishauser (ueli.rutishauser@cshs.org) for more info. Currently admitted Caltech graduate students can contact us to arrange a rotation. We pre-dominantly recruit from the CNS program but are open to other programs as well. Cedars-Sinai Office: Advanced Health Science Pavilion, Rooms A6441-44; Phone 310-967-8364. Profile E-mail. PhD, 2008, Computation and Neural Systems, California Institute of Technology (with Erin Schuman and Christof Koch). Post-doc, 2008-2010, California Institute of Technology (with Erin Schuman). Post-doc, 2010-2012, Max Planck Institute for Brain Research (with Gilles Laurent). We are investigating the neural mechanisms of learning, memory, and decision making. We are a systems neuroscience laboratory and use a combination of in-vivo single-unit electrophysiology in humans, intracranial electrocorticography, eye tracking, behavior, and computational and theoretical approaches. An overarching goal is to capitalize on special neurosurgical situations to advance knowledge of the human nervous system. We have helped pioneer the technique of human single-neuron recordings and continue to advance the tools, methods and surgical techniques that allow such experiments. Recent work has focused on the neural representation of novelty and familiarity in the human hippocampus, amygdala and basal ganglia, the theta rhythm, investigation of learning abnormalities in movement disorders, and the neural representation of faces and emotions in the amygdala. February 2018: Our Scientific Data descriptor and public data release is out. December 2017: Our new paper on the PPC appeared in Neuron. January 2017: Juri Minxha's new paper appeared in Cell Reports. August 2016: The lab has been awarded a R01 through the NIMH BRAINS program, covering 2016-2021. 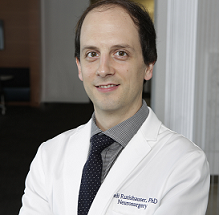 January 2016: Ueli Rutishauser is awarded a NSF CAREER Award, covering 2016-2021. November 2015: Ueli Rutishauser receives a McKnight Endowment Memory and Cognitive Disorders 2016 Award. June 2015: Our new paper just appeared in Nature Neuroscience. April 2014: Ueli Rutishauser is awarded the 2014 Troland Award by the National Academy of Science. Our work is only possible because of a close collaboration between quantitative and experimental neuroscientists, neurologists and neurosurgeons -- combining science and medicine. Our work is only possible because of generous funding by federal, foundation and internal sources. We greatfully acknowledge funding by the National Science Foundation (BCS), the National Institute of Health (NIMH, NIDA, NINDS), Cedars-Sinai Department of Neurosurgery Career Development Funds, Pfeiffer Foundation, Brain & Behavior Foundation NARSAD grant, the McKnight Endowment for Neuroscience, and the NIH NIMH Conte Center at Caltech. The 3rd human single neuron recordings conference took place at Caltech Nov 10-11 2016. See here for the program and speakers and here for a group picture of all attendes. The 4th human single neuron meeting will take place Nov 1-2 2018, at Caltech. Click here for more information. We make available and actively maintain a number of open source software packages (OSort, NLXtools, StimOMatic, WTAsim). Similarly, we are sharing a number of large datasets publicly. Please see here for an updated list of links.